There are many reasons why somebody isn’t flexible, old injuries, body anatomy, lack of stretching, but if there’s one thing the body hates to do, it is to waste its own time. When you stay in positions for extended periods, you’re body notices. Over your lifetime it will hone in on the most efficient way of keeping you in your common positions, using the least amount of energy while providing the maximum amount of strength. Quite simply, if you spend a lot of time moving: your body will get very good at moving, if you spend a lot of time sitting down: you will get very good at sitting down. On a cellular level, your muscle fibres are made of rod-like structures called Myofibrils, which in turn are made of strands called Sarcomeres. 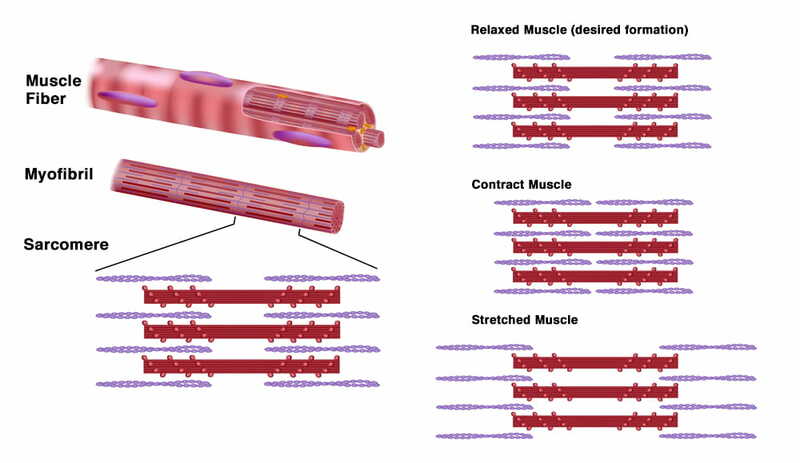 When a muscle contracts, Sarcomeres overlap each other, creating a pull. When a muscle relaxes, they spread out to a looser interweaved pattern. The muscle is at its strongest when it’s not fully contracted, giving it potential to move when needed, and so strives for this state; where the Sarcomeres are in their looser arrangement. As you contract a muscle, say for example your hamstring as you sit with legs at 90 degrees, the muscle will shorten due to the Sarcomeres overlapping to pull the required limbs, and when you get up, it will lengthen again as it relaxes. Imagine a sock returning to its original size after you stretch it. However the problem arises when you begin to stay in that position for an extended period of time. Imagine holding said sock stretched all day – it’s probably not going to relax back into its original position anymore, or at least not as immediately as it did before. It’s the same with your muscles. Your body notices the lack of movement in the muscle and over time begins to restructure the Sarcomeres to form the looser, interweaved formation while still in this contracted position. Therefore your hamstrings relaxed position is now much ‘shorter’ than it once was. Add 10 years of consistent sitting down and hello inextensible hamstrings! People aren’t born with the inability to touch their toes, or squat with a straight back or lift their arms straight above their head, but instead it has come about because of our modern lifestyles. Sitting down (if you can’t tell, I’m not a fan of sitting down) is a major cause of poor mobility. Normal chairs found in schools, offices, etc. will facilitate and even encourage slouching, constantly contract the hamstrings, take all function out of the core, stiffen up ankles, knees, hips and for most cause low back pain. Yay for chairs! And don’t get me started on Sofas, the positions we lie in – especially for those who have a favourite spot – become more and more comfortable to us over time, this is because your body is actually growing into it. The good thing is, that this can also work the other way. Spend a lot of time moving, stretching and building new muscle, your body will react positively. The key point here is “spend a lot of time” moving. With your body’s flexibility, and the same with any sport or exercise, it’s a case of frequency vs. intensity. What you do in one hour of training won’t override what you do for the other 23. When somebody asks me about becoming more flexible, how long did it take me to be able to do a certain yoga move, or can I help them to touch their toes, I have to be honest and tell them to buckle down and prepare themselves for about a year of daily work. It should be uncomfortable, you should be pushing yourself, but you should always be in a place where you can hold it – not shaking, straining and holding your breath, desperately counting to 10. Your body will not respond to a position that it is tensed in – your Central Nervous System will kick in and decide this isn’t a place it likes to be and can even hinder your future flexibility pursuits. Take a leaf out of Yogas book and just breeeeaathe. There is a lot of research out there telling us how long to hold stretches for, some say 10 seconds, some say no benefit will occur under 30 seconds, some even say 2 minutes minimum – so who’s right? Hamstrings for example, I’d recommend around a 1 minute per leg lying stretch, and try that at least once per day. But what is more beneficial is stretching often, regardless of the time spent. By this I don’t mean at every opportunity drop and do a spinal twist, I simply mean try to incorporate stretching into your daily life: try picking things up by bending down with your legs straight (very light objects only, e.g. your shoes or a dropped pen), or getting your washing out of the washing machine in a squat. Every time you’re sat in a chair (grr) spend a few minutes doing a Thoracic Extension, where possible, ditch the chair completely. Notice any opportunity to give your body a little bit of variation. As mentioned previously, stretching and mobility shouldn’t be things that are done for 5 minutes after a workout, something that you have to force yourself to do. Instead, grab a lacrosse ball while you’re relaxing of an evening and roll out that tight shoulder, sit with your legs crossed the other way for a while today. Little and often will show you the most benefits. Just like when lifting, you should be constantly making progress with mobility too. Give yourself goals, take photographs, write down where you could get to in certain positions and notice how that changes over time. Give yourself little tests – Overhead Squat or Front Rack position are great ways of tracking mobility progress. Never forget about the Ankles, Rotator Cuffs, Wrists and Neck! These poor areas of the body get such a beating over our lives and they are often forgotten about during mobility work, until one is injured of course. Warm them up properly and keep them mobile. 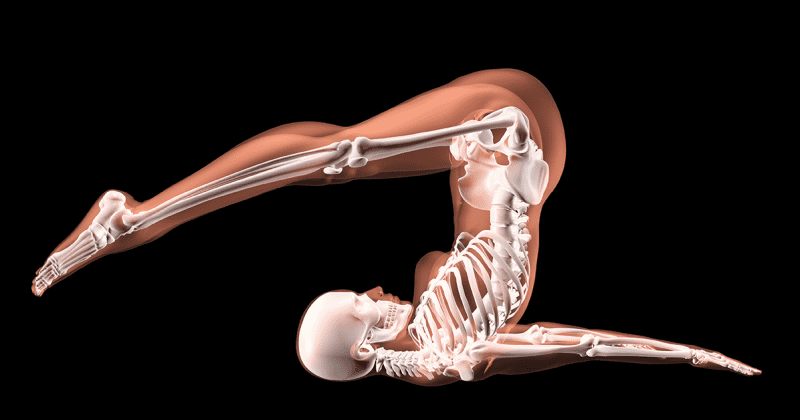 It’s never too late to regain mobility and flexibility, even post-injury or post-surgery. Your body is constantly growing, changing and adapting – try to help it grow the right way.